"Two distinct markets have emerged this summer. The detached home market has seen demand ease back to more typical levels while competition for condominiums is creating multiple offer scenarios and putting upward pressure on prices for that property type," Jill Oudil, REBGV president said. There were 5,721 detached, attached and apartment properties newly listed for sale on the Multiple Listing Service® (MLS® ) in Metro Vancouver in June 2017. This represents a 2.6 per cent decrease compared to the 5,875 homes listed in June 2016 and a 5.3 per cent decrease compared to May 2017 when 6,044 homes were listed. "Home buyers have more selection to choose from in the detached market today while condominium listings are near an all-time low on the MLS® ," Oudil said. "Detached home listings have increased every month this year, while the number of condominiums for sale has decreased each month since February." "Market conditions will vary today depending on area and property type," Oudil said. "It’s important to work with your local REALTOR® to help you understand the trends that are occurring in your community." The Real Estate Board of Greater Vancouver is an association representing more than 13,500 REALTORS® and their companies. The Board provides a variety of member services, including the Multiple Listing Service® . 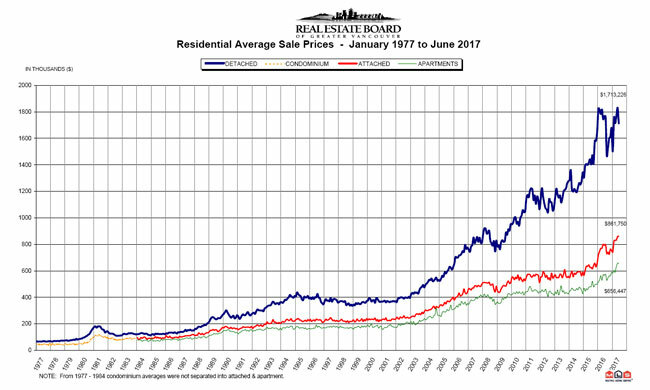 For more information on real estate, statistics, and buying or selling a home, contact a local REALTOR® or visit www.rebgv.org.